Many of the companies failed in this global economic downturn. 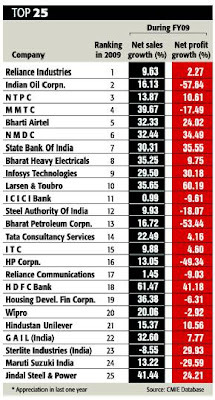 Economic Times has published a list of big corporates who fought this slowdown successfully and have emerged as winners. Checkout.. The winners in the slowdown conundrum that took the top 10 positions, a couple surprisingly so, include Reliance Industries, Indian Oil Corporation, NTPC, MMTC, Bharti Airtel , NMDC, State Bank of India, Bharat Heavy Electricals Limited, Infosys Technologies and Larsen & Toubro. While Reliance Industries topped the list, Indian Oil Corporation (IOC) occupied the second position . Size did matter for them. Reliance Industries, although, did not show any impressive growth figures but the absolute numbers have been so large that there was no close competition and so it made the top billing quite easily. The net sales of Reliance Industries went up by merely 10% in FY09, whereas, net profit grew by just 2%. And while stocks of Reliance Industries did not perform remarkably well during the last one-year , the market capitalisation appreciated by 3%. The second ranker, Indian Oil Corporation (IOC) posted a net sales growth of 16% during FY09 against 14% a year ago. However, though there was a dip in net profit in FY09, the market performance was impressive. The market capitalisation of the company went up by 48%. National Thermal Power Corporation (NTPC) was at third position. In fact, NTPC gave cut-throat competition to IOC. The performance of NTPC in the ranking was much better than IOC on every front, but since net sales of IOC was much higher than that of NTPC, IOC scored higher. As far as financial performance of NTPC was concerned, net sales and net profit grew by around 14% and 11% respectively during FY09. The next three positions 4th, 5th and 6th were occupied by MMTC, Bharti Airtel and NMDC respectively. Telecom major, Bharti Airtel , which posted an impressive financial performance , however, failed to rake in good returns for its investors, as performance on Dalal Street was poor. The market capitalisation of the company declined marginally. As we all know the banking sector has a high degree of correlation with the economic factors, and any macro level changes directly impacts the system. Not just size but also the robust growth of State Bank of India (SBI), the largest bank in India, helped it to feature among the top ten league at the 7th position. It maintained 30% growth in its net sales and net profit. In fact, the market capitalisation also increased by almost the same percentage. Among the other top rankers in the banking industry were ICICI Bank and HDFC Bank. While ICICI Bank secured the 11th position, HDFC Bank came at 18th. HDFC Bank not only showed healthy financial results but also gave good returns in terms of appreciation in the market capitalisation . It gave a return of over 30% in the last one year. Paresh Sukthankar, executive director, HDFC Bank said, What really helped us was not what we did during the slowdown period itself, but what we did not do during the preceding boom period. We moderated our growth rates in certain areas while continuing to invest in growing businesses. We almost doubled our distribution network from 761 to 1,412 branches organically and through the Centurion Bank of Punjab (CBoP) merger. As retail loan demand picks up, we are extremely well entrenched as a market leader in almost all the loan products. In the wholesale customer segment, we see growth in transactional banking, working capital and term loans, and treasury products. With a wider distribution network, multiple customer and product franchises, a growing retail deposit base and a strong capital adequacy ratio of 15.7%, we are well positioned to grow at a healthy clip, particularly as the economy picks up further. The almost recession-proof FMCG sector ensured that there was not much of an impact on Hindustan Unilever (HUL). Not just in terms of financial performance, it also fared well in the equity market . Its net sales and net profit grew by 15% and 11% respectively in FY09. Consequently, the company bagged 21st position. Said Harish Manwani , chairman of HUL in the AGM, India is a diverse country but all of them hope for a better life hence we focus on a strategy called straddling the pyramid. Under this we focus on every category. He further explained it by giving an example; Wheel caters to the bottom of the pyramid, Rin serves mid-segment and Surf Excel serves the upper strata. Also, in other categories Hair, Oral Care and Tea we use the lucrative prices and small unit packs to serve the whole pyramid. In order to lower the cost, we started a new model called Go-To-Market . Similarly, in the auto sector, which was one of the major losers in the slowdown battle, Maruti Suzuki India, the largest domestic car manufacturer, ranked 24th despite the fact that its net profit declined by almost 30%. On the other hand, it showered investors with good returns in the equity market. In the last one year, it gave a return of around 40%. A company spokesperson of Maruti Suzuki India said that reaching new markets, improved products, service development and increasing exports helped them to get the higher ranking. To sustain the sales level, we penetrated the unexplored local rural market. We also launched a brand new engine (K series engines) and two global car models: A-star and Ritz. Apart from this we enhanced our after sales service network across the nation to support the increasing volumes of sales. On the production front, we expanded our capacities to reach a million units annually. These factors have helped us and we are proud to register an all-time high sales figure of 7,92,167 units during 2008-09 . Also, Hero Honda Motors, the largest manufacturer of motorcycles with a marketshare of over 55%, occupied the 31st position. In order to combat the slowdown and come out as a winner, the strategy that Hero Honda took was a sharper focus on topline growth, building a contemporary portfolio with a wide range of models and increased spending on advertisements. Said Anil Dua, Sr VP marketing & sales, Hero Honda Motors, Our performance is better mainly because of the six strategies that we took. Our main focus was on top-line growth. Second, building absolutely robust contemporary product portfolio with a wide range of models. Third, we did serious brand building activities. Besides, we also kept spending on sales and marketing. In the last three years we have doubled the total touch points to more than 4,000 from 2,000 earlier. Under the rural vertical, we have more than 500 rural sales executives, who literally go to all villages. We have a multi-focal approach and focus on bikes for every segment from 100cc to 150 cc and above. And for women we launched scooters, too. Another public sector bank, UCO Bank registered robust net sales and net profit growth. Both the top and bottom line grew by 25% and 35% in FY09 and it positioned itself in the 119th place. According to S K Goel, CMD at UCO bank, going forward to improve the financial strength of the company , the focus would be on reducing non-performing assets (NPA), increasing the CASA and fee-based income. Among the financial service companies, equity broking companies were also affected adversely as the trading volume came down substantially. Among the listed players, companies such as Geojit BNP Paribas Financial Services witnessed a decline of 27% and 70% respectively in its net sales and net profit during FY09. It bagged the 348 th position. But it has also shown a sharp recovery as in the first quarter of FY10 its net sales went up by 84%. According to C J George, MD of Geojit BNP Paribas Financial Services, adequate steps have already been taken in terms of decreasing the cost and strengthening the existing channel and launching new products such as currency derivative and real estate broking. Again it was an bad year for real estate companies. Parsvnath Developers and Sobha Developers found themselves in the 263rd and 261st positions respectively. During the last year, the demand in real estate dried up completely. Also, these were the stocks, which lost relatively higher in the stock market. Both of the above mentioned companies lost above 45% of their market capitalisation during the last one year.